Nikita is still looking for this puppet. 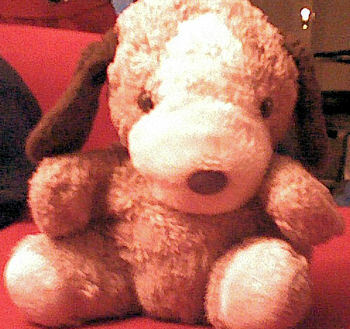 I am trying to find out who manufactured a stuffed animal dog puppet that I’ve had for about 18 years. I believe I bought it in Cherry Hill, NJ in either a Strawbridge & Clothier or Clover department store. I remember that it was on sale with a whole bunch of other stuffed dog puppets, but the others were more cartoonish. I’ve worn/washed away the tag, so I don’t know who makes it, but I vaguely remember that it may have been in Korean. Any help would be much appreciated, because I want to see if I can find a replica, or some way to repair the one that I have. Hi there, I already sold an item that looks similar, so it may help you track down the one you are looking for, My listing gives the year and brand, so you can try looking for it using info from my listing. Thanks for the fast posts. I'm trying the different companies for any leads! This looks more like a Ron Banafato brand puppet to me. Good Luck with your search! I will look into Ron Banafato as well. However, it may actually be a Ganz. I'm talking with the company and trying to see if they have an item number to confirm it. Thanks again everyone! Do not know if you have been able to positively identify the brand or if you are still searching. Let us know. I forgot that I had posted on this site since I haven’t received a response in so long. I was never able to figure out the origin of my stuffed animal. I think that my dog is from the early 90s, so it doesn’t resemble the one in the link recently posted. However, if you have any more information, I would appreciate it.